Since our founding in 1974, Sport Court has pioneered the concept of the backyard game court, and has continued to lead the pack in modular sports flooring. Not only were we the ‘first’ and the ‘only’ in the development of safe, durable outdoor sports surfaces, we’ve set quite a few additional landmarks along the way. 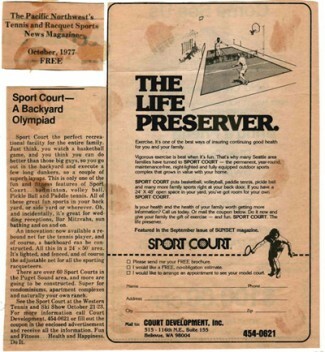 Sport Court was founded in Seattle, Washington in 1974. Operations were moved to Salt Lake City, Utah in 1976 where we have operated continuously since that time. Sport Court introduced the backyard game court concept to the world bringing a safe place for families to come together and play. 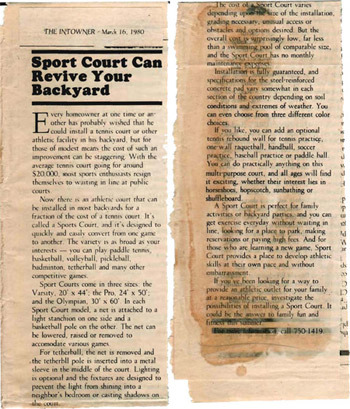 The centerpiece of Sport Court's business in the beginning was the backyard game court, on which a variety of outdoor sports and recreational games can be played, including basketball, volleyball, badminton, tennis, shuffleboard, and roller hockey. The key to Sport Court's early success was the development of a unique, patented, modular playing surface that is colorful, durable and impervious to weather. Over 35 years ago, Sport Court established the first dealer of modular flooring in Seattle, Washington. Doug Dulin, the first Court Builder is still with the company today. Sport Court remains the leader with the largest network of Court Builders scattered across the world. We are the World's Largest Court Builder! Sport Court moved to Salt Lake City, Utah and began operations. Today the company's headquarters operates out of a 75,000 square foot manufacturing facility for modular products with a 70,000 square foot, highly advanced warehouse distribution center which gives the company the ability to ship your court when you are ready for it. Sport Court as your family's life preserver! This is one of the earliest advertisments in 1977. 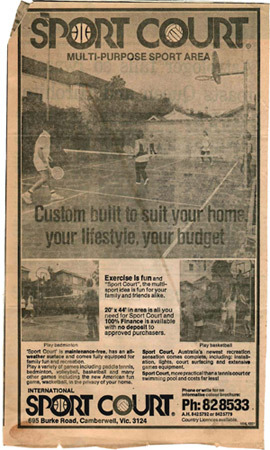 As Sport Court began to develop a network of dealers across the country; we began to run promotions. This is from a 1978 newspaper in Dallas, Texas. Jim Fox, our Distributor for the Phoenix, Arizona area has been with Sport Court for 34 years! And today continues operations in Phoenix with his family. 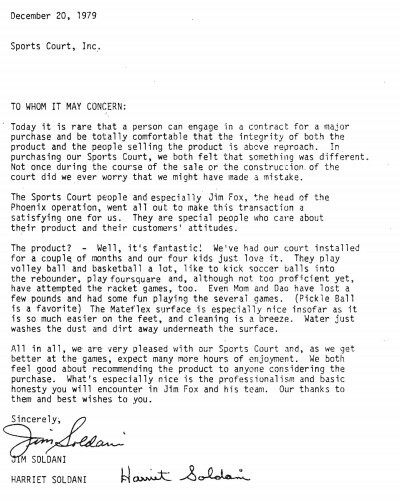 This letter comes from a customer in Phoenix after his court was built by Sport Court. 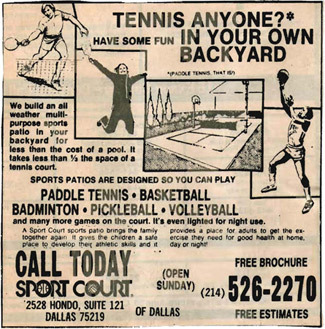 Sport Court began to expand in the international market and ran this advertisement in 1979 in Canada. Today, Sport Court has built a court on all 7 continents including Antarctica. By 1980 the Sport Court game court concept had grown rapidly. During this year, we brought all of our production operations in house. Today we operate out of a 70,000 sq ft facility with nearly 100 employees. Sport Court can revive your backyard! An early article that appeared in The InTowner magazine in 1980. Sport Court has a network of Court Builders that span the globe. 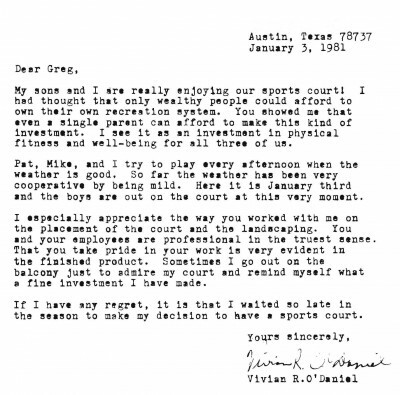 In 1981, our distributor in Texas, Greg Dettman, received this letter regarding an court he had built. Greg has been building courts for Sport Court for 33 years and is still with the company today! Another early advertisement from 1981 in Tallahassee, Florida. "Mini-Tennis court that fits your yard (and your budget)"
“No other technology has done more for the growth of volleyball than Sport Court playing surfaces,” says Doug Beal, CEO of USA Volleyball. In 1989, Sport Court became the official playing surface of USA Volleyball. Since 1991, every U.S. Men's and Women's National event, U.S. National Open and Junior National Championships have been played on Sport Court surfaces. Originally developed for the Roller Hockey market, Sport Court launched the first ever indoor modular flooring surface. The revolutionary design of modular indoor flooring changed the market and put Sport Court in the forefront for indoor courts. These indoor modular systems developed solid uses for indoor applications including gymnasiums, roller hockey rinks, garages, decks, and special events. Later, in 1992, Sport Court returned to our roots and provided the first sport specific flooring for the Roller Hockey International Professional league. Sport Court surfaces were used for the first time at both the Men’s and Women’s NCAA® Volleyball Championships in 1993 and our relationship with the NCAA remains strong today. Since 1993, every NCAA Division I Men's and Women's Volleyball Championship has been played on a Sport Court surface. Sport Court also teamed up with the NBA for the first time in 1993, to support events at the NBA All-Star weekend. Sport Court became the official member of the FIBA Study Centre (FIBA is the world’s governing body for basketball). And we're proud to be the only outdoor surface approved by FIBA for outdoor competition. 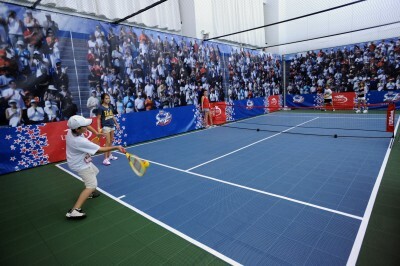 Sport Court is also the only modular sports surface used for a national team event, USA vs. Italy. 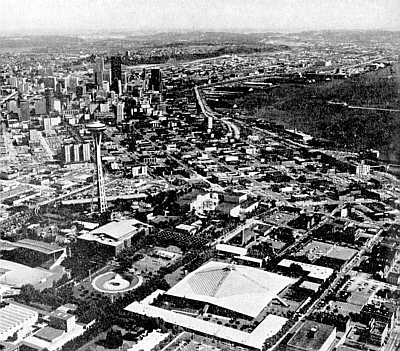 Sport Court provided over 60,000 sq ft of flooring for the Coca-Cola pavilion during the Atlanta Summer Olympics in 1996. That same year, our high-performance indoor surface, Response™, was introduced. Talking about some amazing places to build a court! Sport Court created the first modular court on a military aircraft carrier and built the first underwater hockey rink. Sport Court surfaces were first chosen in 1998 for the European Handball Championships. Today, Sport Court remains the approved surface for International Handball competition. 1999 marked the end of a 20th century and a time of substantial growth for Sport Court. We became the first modular sports flooring company with courts installed in all 50 states! It was the first step in becoming the World's Largest Court Builder. 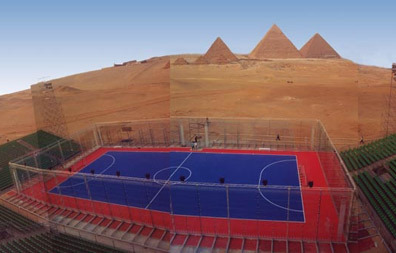 In an unprecedented location, Sport Court built outdoor courts for an internationally televised professional futsal event staged at the famous Pyramids in Egypt. 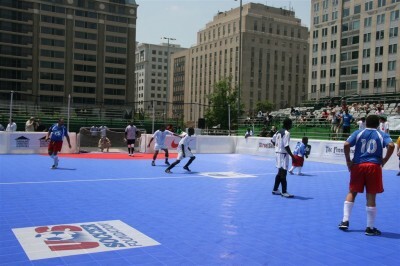 The courts provided playing surfaces for AFC (Asian soccer) and UEFA (European soccer) events as well. Sport Court was also endorsed by the Brazilian Futsal Association and became the official playing surface of the Indonesian Volleyball league, the Pro Liga. 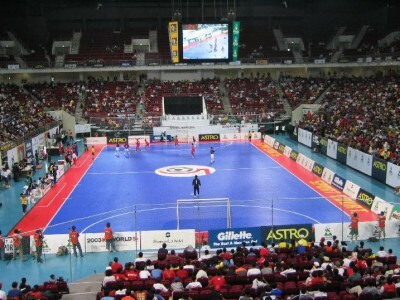 In 2003, Sport Court became the official playing surface of the AFC Futsal Championship, held in Iran. The Asian Football Confederation (AFC) Futsal Championship is the the largest futsal tournament in the world and is played annually. Sport Court was choosen as the official futsal surface of the KL World 5s - the largest cash prize competition for national futsal teams in the world. 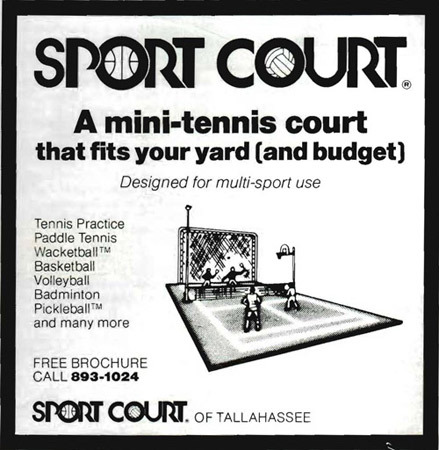 Also in 2004, Sport Court was acquired by The Riverside Company. 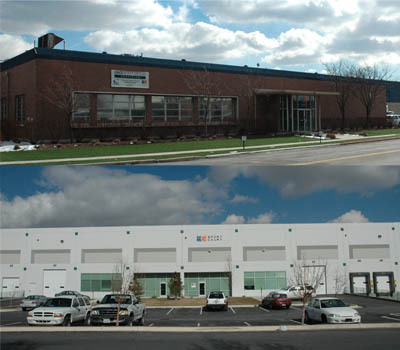 In 2005, the company purchased Connor Sports Flooring; creating Connor Sport Court International. Founded in 1872, Connor Sports Flooring is the market leader in wood sports flooring systems. Connor has built maple hardwood courts for NBA teams and countless numbers of NCAA schools and univerisities, with products for every level of competition. That same year, Sport Court was selected as the official playing surface of the Japanese professional basketball league, known as the BJ League. Also launched 2005, Sport Court introduced PowerGame™, an outdoor modular surface that today leads the industry in performance. The U.S. Soccer Foundation, the charitable arm of soccer in the Unites States named Sport Court as the official futsal surface provider of the U.S. Soccer Foundation. Together Sport Court and U.S. Soccer Foundation use soccer as a way to improve the health and well-being of children in disadvantaged areas. Each year, Sport Court provides the surface for the Homeless Cup for the foundation. Sport Court is committed to providing the higest standards of quality, safety and performance for its customers. Sport Court is the first and only modular sport surface manufacturer to achieve ISO 9001 certification. This standard assures our customers are receiving the highest quality product. The United States Tennis Association named Sport Court the official surface for the USTA. Sport Court provides courts as part of the USTA initiative to revitalize its new junior tennis training program, designed to introduced younger players to the game of tennis. Sport Court builds courts for the SmashZone at the US Open and has built four courts at the National Tennis Center in Flushing Meadows, New York. Sport Court was independently audited and designated as a Zero Waste company. Sport Court continues to look for ways to reduce its impact on the environment. 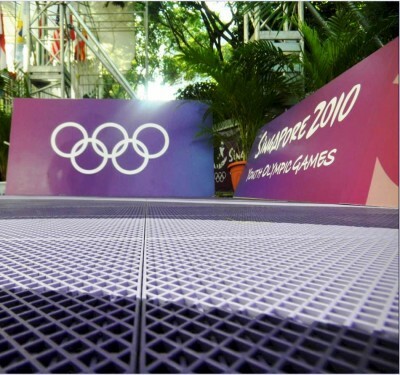 Sport Court is the first and only outdoor modular surface used in Olympic competition in the FIBA 33 basketball event at the Singapore Youth Olympics. Sport Court also introduced the Response HG and Response HR indoor flooring lines. Sport Court achieves the environmental standard with ISO 14001 Certification becoming the first sports flooring company to achieve the standard, keeping in line with our Zero Waste initiatives. 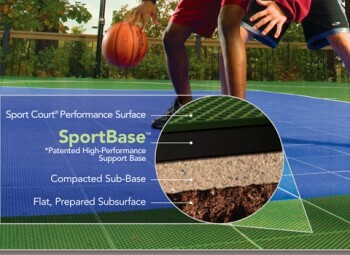 In 2011, Sport Court launched the SportBase™ product line. This revolutionary "green" modular sub-structure is an alternative to concrete. SportBase™ is made from 100% recycled polypropylene and is environmentally friendly.